Astronaut Jerry Ross approaches the Assembly Concept for Construction of Erectable Space Structures device during an EVA on an Atlantis mission in 1985. 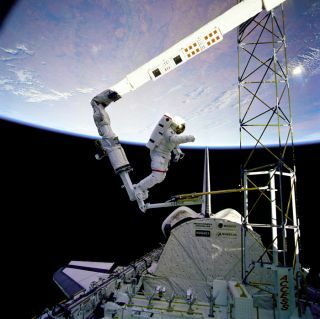 In this historical photo from the U.S. space agency, Astronaut Jerry L. Ross, anchored to the foot restraint on the Remote Manipulator System (RMS), approaches the tower-like Assembly Concept for Construction of Erectable Space Structures (ACCESS) device. The structure was just deployed by Ross and astronaut Sherwood Spring as the Atlantis flies over white clouds and blue ocean waters of the Atlantic on December 1, 1985.